In Bharatkoop, home to the landless Kol Adivasis, stone-crushing units are the only avenue for employment. Even MGNREGA has had little impact here. The white of the June sky was mirrored by the powdery film that covered the bare hillsides, the electric poles and the thatched roofs of houses in Bharatkoop. The village lies about 15 km from the district headquarters of Chitrakoot in Uttar Pradesh’s Bundelkhand region. The area is known to be dry and rocky today, but the hills here were verdant before the stone-crushing units arrived more than two decades ago. The hills are rich in grey limestone which is used to build roads. For the residents of Bharatkoop, most of them Kol Adivasis, the stone-crushing units were a welcome source of employment. “There is nothing else, no land, no farming,” said Beti bai, a resident. In other states, the community has the status of Scheduled Tribes, but in Uttar Pradesh, it is counted among the Scheduled Castes. Most members are landless. According to Pappu Bhaiyya, a resident of Bharatkoop, there are 150-200 stone crushing machines operating on eight to ten hills of the region. Of these, only about 50 are operated by licenced contractors, he said. He estimated that about 2,000 to 2,500 people are employed in these quarries, “but that’s just the local population”. When there is drought in the region, he said, people come from about 30 villages nearby to work in Bharatkoop. In March 2016, however, everything came to a standstill. The stone-crushing machines in Bharatkoop were banned from operating after some workers died in accidents in the quarries in the neighbouring areas of Akbarpur and Mahoba. The deaths attracted media coverage and caused an uproar among locals. The resultant pressure compelled the state government to take action and shut down some quarries in that belt – albeit for a year. This April, the ban was revoked. But for the months that it was in place, the ban meant that no work could be carried out in the quarries or the stone-crushing units. Within weeks, Bharatkoop became a ghost town, and the daily wage labourers from the quarries migrated from the village in search of work, leaving behind their wives, mothers and children, many of them starving and sick. Lakshmibai was the elder in a group of mourning women. It was April 2016. A two-year-old girl named Ruby had died. “She hadn’t completed two [years of age], she was a year and seven months old,” said Lakshmibai. Her mother was returning from Allahabad on the passenger train, after selling some medicine, when the child’s health deteriorated suddenly, she said. Healthcare could not reach her on time – the family, entirely dependent on the work in the stone crushers, most likely couldn’t afford it. In another house, a woman lay next to her two-day-old baby. Rajni had delivered the newborn in a government hospital in the neighbouring village of Shivrampur, under the supervision of a doctor. Back home, however, Rajni had no food to eat. She said all she had eaten that day was jaggery made by her mother with some buttermilk. A year after the ban, ostensibly under pressure from the rich and influential quarry owners, the government allowed work to resume at the quarries in April. When the stone-crushing machines returned, so did some of those who had migrated, and residents heaved a sigh of relief. But their troubles were far from over. The most striking thing about Bharatkoop is not the white cloud suspended over it or the persistent noise of the crusher machines. It is how terribly thin everyone is here. The stone crushing machines that have provided livelihood to villages here have also been a major cause of illnesses and death. In Bharatkoop, many residents suffer from respiratory ailments like asthma or tuberculosis. 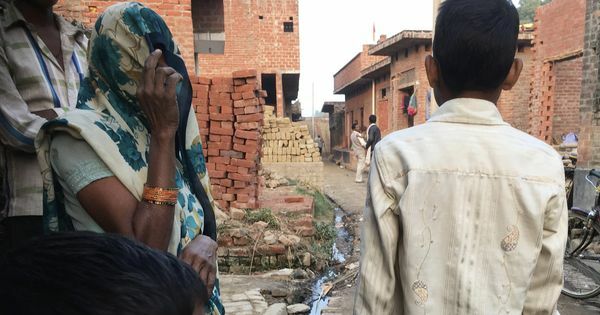 In Akhbarpur, a nearby panchayat, people said tuberculosis and death stalked every household. The fine particulate matter released by stone crushing units, which can enter the lungs and the bloodstream, can turn fatal not just for those working at the quarries but for residents of the entire village. Champa, a resident of Bharatkoop, has a concave stomach. Doctors had told her that she has an “illness of the breath”. She had been given medication that made her feel intoxicated. Keshkali, another resident, was not sure whether the respiratory disease that a relative of hers had died of a few months earlier was tuberculosis. Gulzardevi, another resident and labourer, however, had been diagnosed with the disease. She said people work in the quarries till they have the strength to, and then they die of tuberculosis. Over the last two years, Khabar Lahariya has visited Bharatkoop several times to track the conditions in which people live and work. Each time, the situation has been the same: widespread poverty, absence of basic entitlements, and the sight and sound of crusher machines that support livelihoods and at the same time take lives. While revoking the ban, the administration created rules for the operation of the crusher machines. They mandate that crusher units create enclosures in the areas in which they operate and spray water to reduce dust levels in the air. But the contractors who operate the machines thumb their noses at these norms, the residents of Bharatkoop claimed, and there is no one to hold them accountable. Bhola, a labourer, who had gone to work in Mumbai when the quarries closed, returned to Bharatkoop after they reopened. He faintly smiled when asked about the working conditions in the quarries. “There’s nothing that you can do about it [the dust from the crushers],” he said. The only other source of employment is the Mahatma Gandhi National Rural Employment Guarantee Act, but the programme has done little in Bharatkoop, where quarry work which is monopolised by contractors remains the primary livelihood option. Kalinjer, the panchayat mitra who assists people with documentation and payment under NREGA, said there was a tussle over the ownership of land between the Adivasi inhabitants and the contractors. The private contractors who operate the crushing machines claim that the land is theirs even as Adivasi communities assert that the land has been occupied by their families for generations. However, there is no one to verify the contractors’ claims on the land and the village residents do not really protest either, as the quarries are the only hope for employment. In the Union Budget for 2017-’18, the budgetary allocation for NREGA was increased and both the Centre and state government claim to be focusing on rural livelihoods. But, in Bharatkoop, a poor community lives and dies on the white dust of the stone-crushing units, and no one seems to care.